Friday: Item drop off from 4pm to 8pm. Saturday: Shop between 10am and 5pm. Auction ends at 5pm. Item pick-up and seller payout from 5pm to 7pm. Sunday: Last chance pick-up from 8am to 10am. Additional details and downloadable item registration forms will be released soon. Please note that this year there is a $1 registration fee per lot placed into the auction. Premier badge holders may place up to 10 lots in the auction at no charge. Don't miss out on the 2019 Milwaukee Open! This Magic: the Gathering tournament has several events over the course of our show with fantastic prizes. You won't want to miss this event! A standard convention badge is all that is required for our tournaments, with no additional participation fees. Magic Badges can be purchased if you only wish to play in the MTG tournaments. The 2019 MTG Tournament schedule will be announced soon! Do you have what it takes to be a Catan champion? How does an all-expense paid trip to an awesome game convention sound to you? Nexus Game Fair is pleased to offer our attendees an opportunity to play in a Catan U.S. National Qualifier. 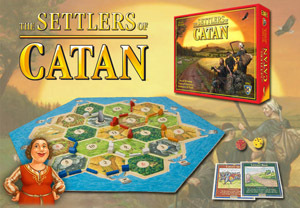 The winner of our event will have special Catan-themed prizes and a seat at the National Championship at the 2019 Origins Game Fair in Columbus, Ohio! Nexus Game Fair is the absolute last qualifier for the 2019 Catan United States Championship. The prelimary round will be played Friday, with the semi-finals Saturday and finals on Sunday. Please note that you must be 18+ years of age and a citizen or legal resident to compete in any Catan National Championship event. Additional information can be found here and a great video about the event can be viewed here. If you haven't heard of it, you are missing out! This tournament is all things trains! Play in a couple rounds or play all convention long. Come see the latest train games along with some classics, and compete for some great prizes. For more information about the Train Gamers Assocation and the Puffing Billy tournament, check out their website here. Who doesn't like free board games? Stop by our Play to Win area throughout the weekend and try out over 60 of the latest titles from a number of generous game manufacturers and publishers. Not sure what Play to Win is? Play to Win is a simple program by which games are donated by publishers and designers to conventions for attendees to learn, play, and ultimately, have a chance to win them and take them home at the end of the convention. That's right, all of these games are given away to attendees via a Sunday drawing! each time a game is "played", all participants will receive a chance to "win" the game. There is no limit to the number of Play to Win titles you can play and therefore earn the opportunity to win. Be sure to stop by and check out this awesome event sponsored through the Envoy program of Double Exposure, Inc. A list of publishers and titles will be available soon.